The Minerals Council South Africa (Minerals Council) established the Learning Hub in 2009 to encourage mining companies to learn from the pockets of excellence that exist in the industry through an adoption process which involves identifying, documenting, demonstrating and facilitating widespread adoption of leading practices that have the greatest potential to address the major risks in health and safety areas such as falls of ground, transport and machinery, dust and noise. Practices that reduce occupational lung diseases and improve occupational health. Practices to prevent the deterioration in hearing amongst occupationally exposed individuals. Practices with the highest potential for reducing occurances of uncontrolled falls of ground. 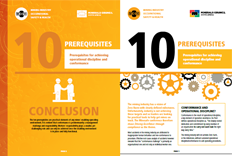 Practices with the highest potential for reducing instances involving transport and machinery. The first step in using the website, as an aid to adoption, is to select the leading practice that is of interest. The next step is to complete the registration detail to acquire or update the user profile that is required for access to the selected leading practice. Opens the form on which to provide the user details required by the website overseer to check with the relevant adoption team and to allocate an appropriate user profile and password. Opens a description of the four possible user profiles and outlines the intention, scope and limitations of each. Explains that, when the profile is opened, the user can access adoption guidance and progress information on all leading practices in the profile. Some of the activities in the adoption process require that the user download a document that needs to be completed, uploaded and submitted before the activity can be signed off as completed. The user is provided with an option to bypass this requirement, but this is duly recorded. The steps requiring completion of a downloaded document are particularly important in that, together, these completed documents constitute a portfolio of evidence indicative of progress and the extent and quality of the adoption process. 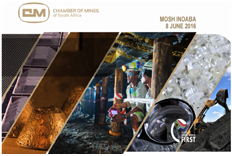 Outlines the process of uploading the previously downloaded document and emphasises the need to ensure that the document properly reflects the extent of what has x`been done at the mine. Submitted documents will be preserved in the system as a portfolio of evidence in respect of the adoption process undertaken by the mine for the leading practice in question. The mining industry has a vision of Zero Harm with clearly defined milestones. Unfortunately, industry is not achieving these targets and so leaders are looking for practical tools to help get mines on track. The Minesafe conference therefore chose Driving Excellence through compliance as the theme. 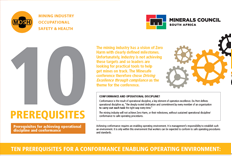 The mining industry has a vision of Zero Harm with clearly defined milestones. Unfortunately, industry is not achieving these targets and so leaders are looking for practical tools to help get mines on track. The Minesafe conference therefore chose Driving Excellence through compliance as the theme for the conference. This website and its content is copyright of the MOSH.